In the middle of what was already a saturated market, you and your partners launched Sitka Gear. 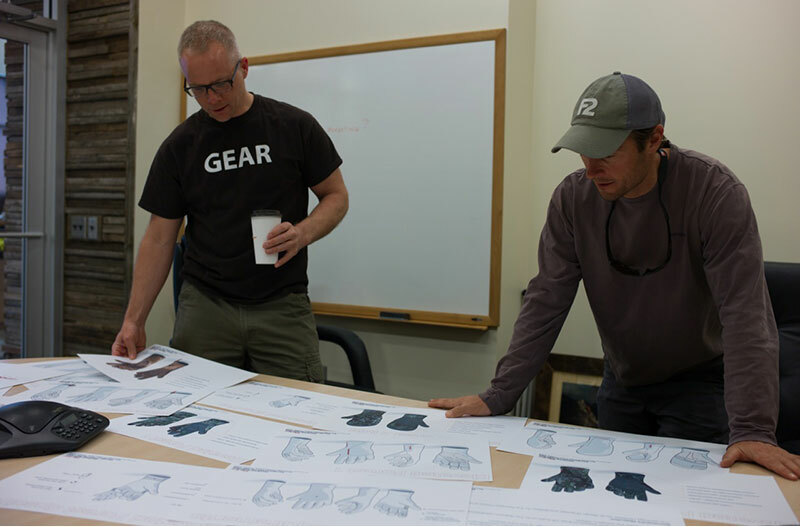 What was the motivation behind starting the Sitka Brand? As clichÃ© as it sounds, it started with a problem. 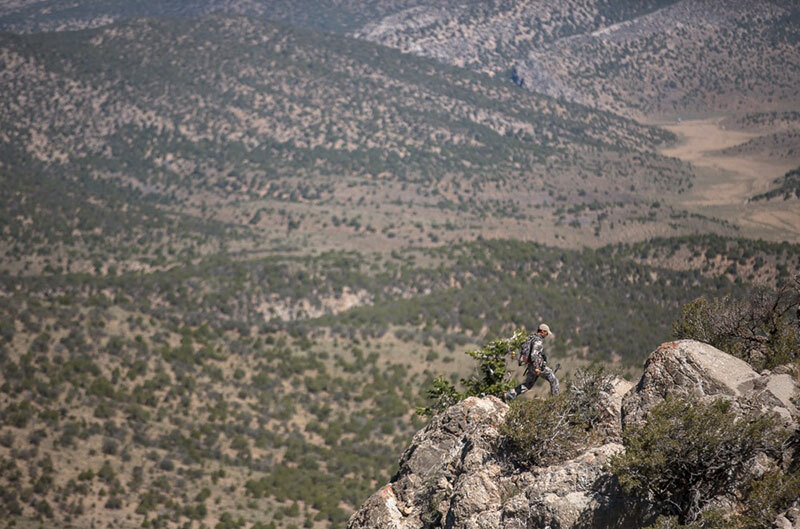 We didn't have the gear that we needed to hunt where, when, and how we wanted in the mountains. These were our roots. Was the market saturated...yes, but with all the wrong product, lacking what we perceived as true solutions for the problems. Adding camo to some jeans and a flannel doesn't empower you to go further, stay longer, get closer. This platform of solution oriented gear became the impetuous to changing our industry in every way we could. We leveraged our technical expertise into other hunting categories, we dove in with both feet to lead change in the development and delivery of inspirational and game changing content, and we continue to heavily invest in best-in-class customer and dealer service. Obviously a lot of thought goes into your products. Can you tell us about your design process? Today, we have a strong platform of industry leading products that cover a broad spectrum of needs. As we continue to grow, the solutions become more specific, more niche, more specialized. Some guys don't care that a rain jacket weighs only 6.3 ounces, or a waterfowl jacket can take 100 straight hours of pounding rain. Others do care. A whitetail hunter wants to be comfortable while sitting motionless in a tree at the freezing point from dawn to dusk. But a mountain hunter wants a product that will adapt to a wide range of exertion. The Process: It always starts with a problem. The team's input from the field is a constant and directly linked to all product. But overwhelming inspiration comes from our team of Athletes and Pro staff, who collectively put in more hours in the field, across a global landscape, to fill - even overflow the funnel of product ideas. These ideas (or opportunities) are captured and vetted. We then ask the questions; can we incorporate small (or large) changes in a current product's form? or do we start down the path of developing something new and end-use specific? One of the first big steps to solving that problem is understanding what the needs of the textile are. In our early years, we were forced to adopt textiles that mills had already developed. We weren't big enough. It's the same problem all new brands face. However, with success comes scale. We earned the ability to drive developments from the ground up that fit our exacting needs. While textiles are being developed, trim development and sourcing with industry leading partners happens simultaneously. The goal being to build prototypes for field use. The use - and abuse phase is one of the most fun parts. It adds time to market - but it's worth it. We don't believe it's right to experiment on our customers. The price we pay is speed to market and we accept that. As feedback comes back from the field, we're simultaneously working through designs that focus on function, but also revelations that come from seeing textiles perform, construction techniques tested, and trims succeed or fail. This process is iterative, and time consuming, but ultimately delivers product leadership. The Sitka brand represents extreme high quality hunting outerwear but at a much higher price point than your 'average Joe' is used to spending.Â Do you envision ever going after the mass market hunter too? We don't believe in going after markets. We don't believe in building products to hit "price points". We build the industry's best product solutions for specific end uses. Â This past year I used your Fanatic series whitetail clothing and was really impressed with the fit and especially the wicking and heat retaining properties of the design.Â Â Has the Fanatic line been a success for Sitka? The Fanatic...nailed it. A runaway success from the start. The Fanatic program is another great story of bringing together design, concealment, and technology to deliver a solution for a specific 'unmet' need. With the Fanatic, we started with your hands...how to keep them warm without sacrificing dexterity. From there, the system took shape to ultimately deliver what we believe is the perfect balance of features and comfort that allow you to stay in the tree all day long, totally focused on that next buck. That focus, that elimination of distractions, is what ultimately drives mental clarity. Hunting is a sport that is based on a series of decisions that never stop. There are forks in the road from the moment you open your eyes in the morning. If we can help you stay focused, and stay longer - keeping you in the game, then we've done our job. Some hunters who hunt open oaks and Cottonwoods have remarked how they love the Fanatic series design but consider the Forest pattern a little dark and uniform for some stand locations. 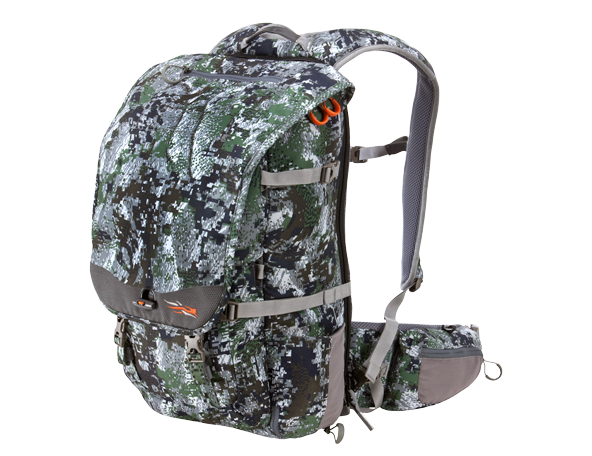 Do you have any plans to introduce the Fanatic line in a lighter, more open camo pattern? Design and concealment are linked to a specific end use. Optimized, so to speak, for an activity. There certainly are design elements of the Fanatic that lend themselves to different engagements, and some of them are in testing now. Will it be a Fanatic, no. But, we're always building new things. 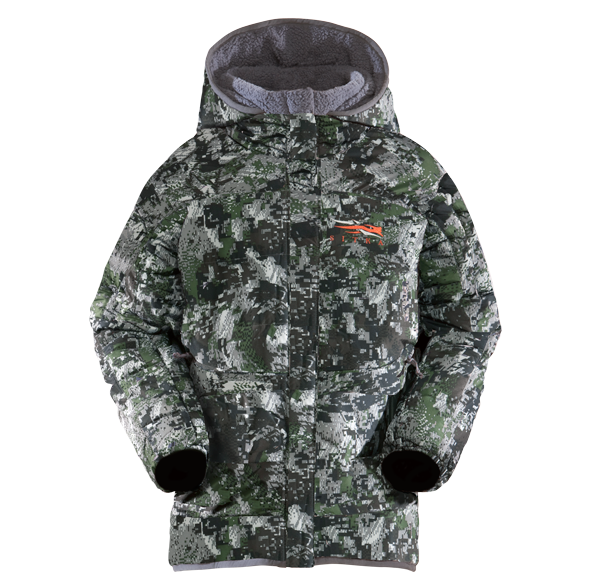 What is your best selling Sitka item? The Jetstream Jacket. In fact, across the entire business, all of our WINDSTOPPER based products generally lead the charge, with the exception of Waterfowl (for obvious reasons). GORE-TEX rules the roost there. But it makes sense, WINDSTOPPER is an incredible platform to build many products off of. It has an extremely broad range of performance in so many weather conditions and activity levels. There's also a wider range of design opportunities since we're not trying to achieve 100% waterproofness. So, we can get more creative with some elements of the garments. At the 2013 ATA show Sitka demonstrated your new ESW pant with the boot gasket. It was brilliant, and I wonder how come nobody ever thought of that before?Â While I know this is just one example of Sitka’s innovation, what was the genesis of that design change? I have to give full credit where credit is due. Jeff Simpson, one of Sitka's earliest Athletes and a true whitetail fanatic, came up with the idea. During a download/brainstorming session on whitetail, he went off on a rant. More of wish list. That was one of 100 things that he spewed out that day (also for the record, Jeff is our harshest critic and never happy with any product...in a good way). He was also the first person to field test the protos for a full season before anyone saw them. He helps us tremendously on refining and evolving the design. 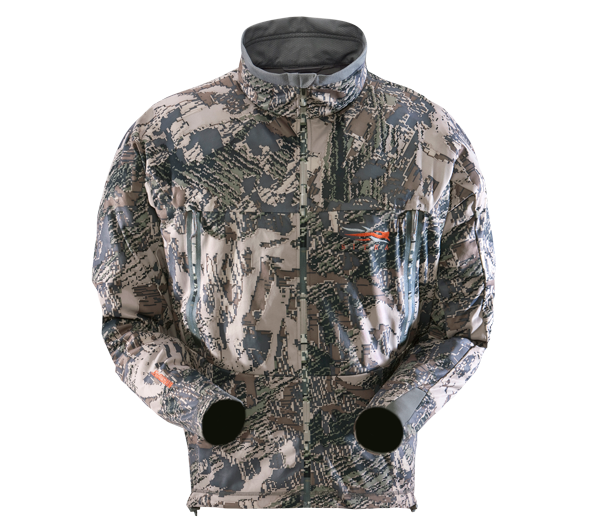 What are your thoughts on the hunting outerwear market - overall? I think that too many brands are trying to spin fads and fashion into a space that should be 100% focused on keeping your head in the game. Funny colors, goofy names, and unsubstantiated claims plague the space. I love to reflect on hunting's heritage, celebrating time in the field, supporting individuals and groups that drive conservation, and especially - our next generation. We focus on product and putting the best gear in the field that we can. We also do it with a strong eye on the environment. One major initiative that we've undertaken is reaching 100% Okeo-Tex compliance by Fall '15. We're already 98% of the way there. No one forced us to, we just know it's the right thing to do and we hope others will follow. 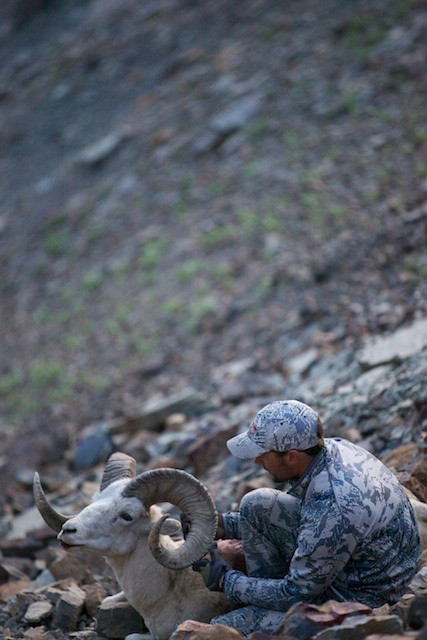 Tell us about your hunting interests and how that has influenced Sitka’s design and brand? Doing anything above treeline is always a bonus. At heart I'm a minimalist (yes, my toothbrush is cut in half). I thrive on the interaction and experience nature provides, but celebrate our role in that chain. I default to the mountains and marshes as my core, but I think that's rooted in my Western upbringing. I'm inspired by the world around me and I've always wanted that frame of mind, that thread of inspiration to come through in our brand. I like knowing the credibility of a team, a family, and extended group of ambassadors share in that same spirit. I don't believe in over complicating that experience and relationship and always push to keep our products aligned with that spirit of simplicity of function. I'm also a full on 'gear head' that crosses over many categories. I draw inspiration from forward thinkers. I'm constantly challenging our team to break paradigms and forget the "well, that's how people do it" statements. Cross pollination drives ideas and opens the door to opportunity, from tech to medical, climbing to sailing. Innovation and ideas can't be forced, but are instead these moments of clarity that happen when you force yourself to broaden your base and open your eyes, ears, and mind to all sorts of stimuli. What did you wear before you started Sitka Gear? Almost everything in the search for "The Kit". When you can't find what you want...you make it. Has Sitka ever considered a footwear line? We are always interested in creating solutions to problems with innovation. Your 2013 line was just announced in June, can you give us a brief summary of the top items this year? The redesigned Stormfront Series has no rival in extreme and extended wet weather protection, period. The durability and protection of the new GORE-TEX package delivers comfort that is unrivaled. The design is specific for those that are forced to survive and live in their rain system. Generously sized pocketing is strategically placed to work with a pack on your back and eliminate the need to access under layers for gear. Wrists and hems seal tightly and pocket configurations promote outward flow of precipitation. 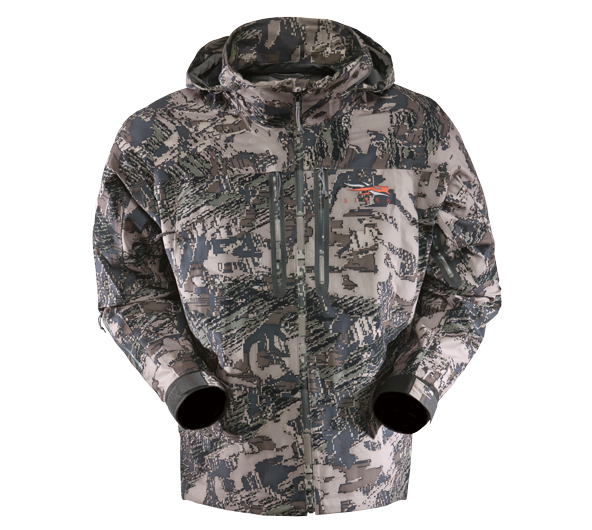 Jetstream Lite - A jacket and vest combo that's built for the fast and light on a WINDSTOPPER platform. Quite possibly my favorite. 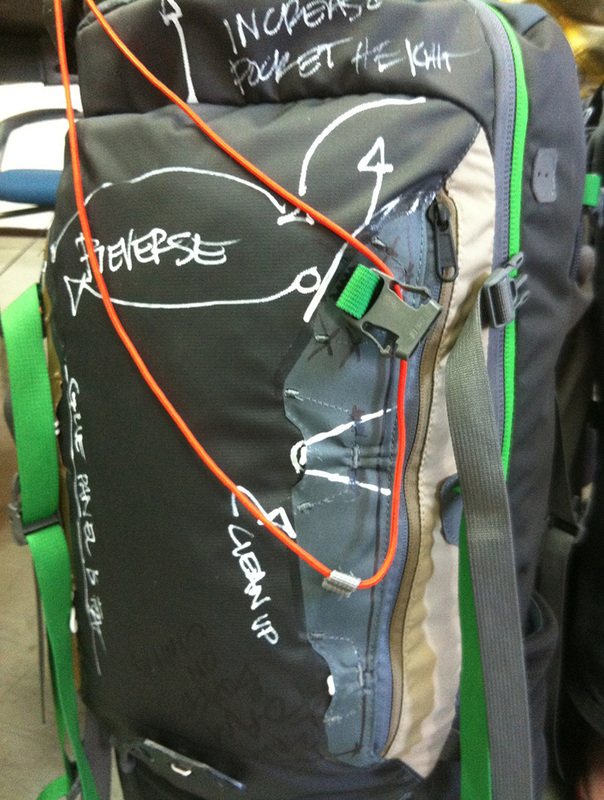 To drive weight and pack-ability down, features are minimalistic and the fit is trim. Nothing extra on these two pieces. I always have one of them with me. 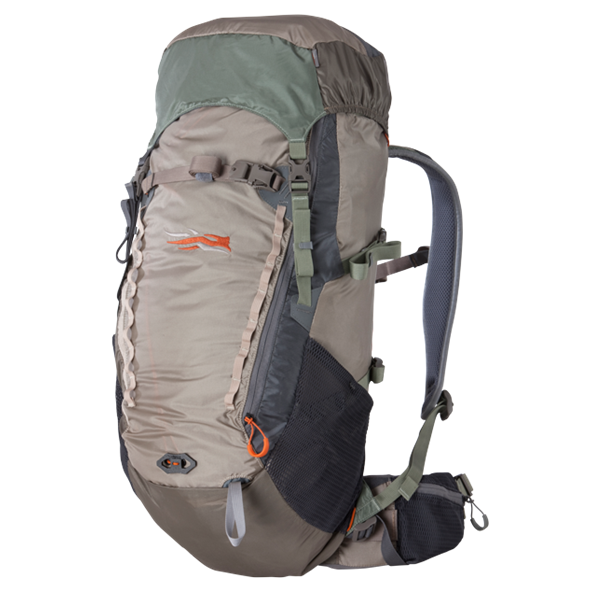 Alpine Ruck - At 2800 cubic, and weighing under 3 lbs, it's my go-to. For full day forays' and short overnighters, this is what I carry. The design is inspired by the Alpine world, keeping things simple and clean. The harness and frame system are optimized for weights in the 50 lb range and though you'll strain it on your first meat load out, it won't buckle. 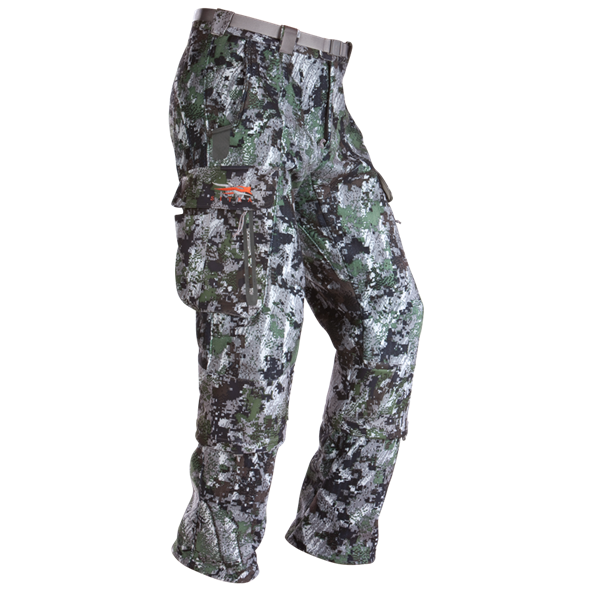 ESW and Stratus Pant - If I have the choice, I'll always reach for a pant in the early season. That's what excites me about these two pieces. The feature set was designed to comfortably let you carry the essentials into your stand without a pack, but also access them easily when you're on stand. Early testers can't stop talking about the boot gasket system and the generous stretch that makes climbing and sitting very comfortable. Toolbox and Toolbucket - Starting with simply a list of "wants" in a bag and pack for the vertical world, these are the two designs that emerged. Similar in spirit to your travel shaving kit, you have quick, quiet, and very easy access to anything you need when perched in a tree. These two pieces will totally change how you carry gear into the whitetail woods. Youth Kelvin Down Hoody - Probably the coolest thing you could stoke your son or daughter with. Not only will they look like you, but they'll be super toasty, and...they're reversible. When your kids are wearing these, it's always a conversation starter with friends and other jealous ones. Rambler and Nomad - For someone who lives their life on the road, in the field, or shuttling gear in-between the two, the Rambler and Nomad give you piece of mind. Built to withstand abuse, the tough-as-nails exterior fabric not only takes the grind, it's virtually waterproof, letting you relax when you sneak a peak out the window of the plane and see your gear in the rain on a dirt tarmac up North. 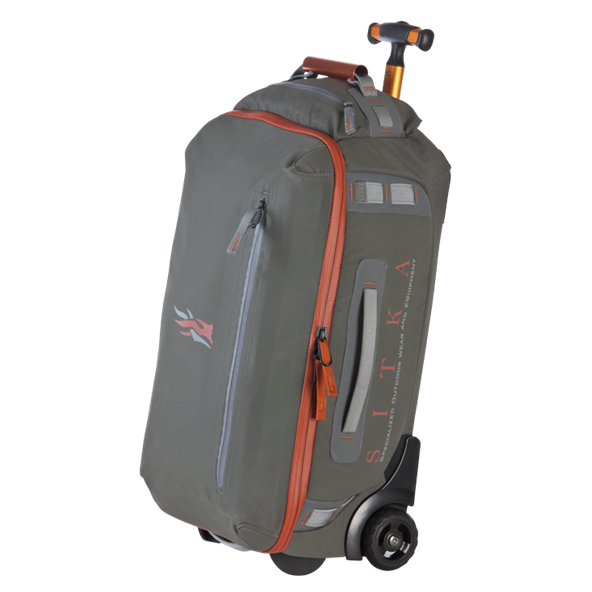 The Nomad was built to comfortably fit most compound bows in it, while the Rambler was scaled down and designed for shorter trips or to buckle on to the Nomad to simplify transport. During a recent conversation you hinted that 2014 may be a big year for a new launch at Sitka. Can you give Bowsiters any hints? 2014 is a great year in terms of launching a few new products in our key categories. You'll also see complete redesigns of a few flagship styles that have been with us for years. It's a very focused year. Where do you see the Sitka brand in 2020? The reference brand. When I reflect on our focused goals specific to driving real and meaningful innovation, coupled with leading inspirational content, built on a platform of deep expertise...who else is trying to do that? "I love it when a plan comes together" - John Hannibal Smith, The A Team. Born Nov 26, 1972 'Sagittarius (archer)' and raised in Northern California which still remains home, but he admits row 3 on United is his office. Jonathan is married with 2 kids and a yellow lab named "Tucker." When he's not hunting he's a Dad, a husband, off riding his bikes, flyfishing, skiing, sailing, climbing, embracing gravity, and constantly looking for inspiration. His resume is varied and extensive; working in the wine industry, through the dot com boom, he was once a treasure hunter then a molding and trim manufacturer. 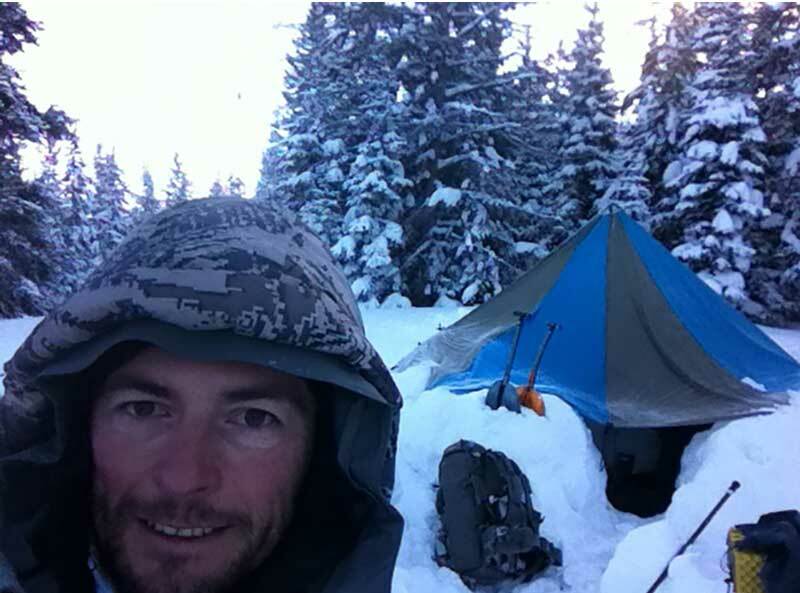 He is a self-proclaimed ski bum and loved living for months out of a daypack traveling through South America with his wife. 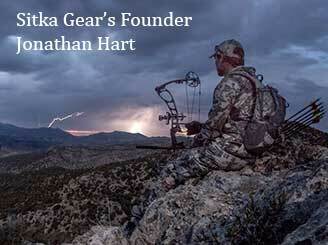 Inspired by bad weather and chasing big game in the mountains, Sitka was founded in 2005. In it's early years, the goal was simply to bridge the gap between the hunting and mountaineering world. Since then, Sitka has grown to not only drive new technologies, but also apply the same strategy of solving the unmet needs of the hunter to both the whitetail and waterfowl categories. Sitka started with one dealer and while their distribution has gone global since then, they still stick to the model that made them successful: focus on solving the unmet needs of the hunter.